"Orchid" redirects here. For other uses, see Orchid (disambiguation). The Orchidaceae are a diverse and widespread family of flowering plants, with blooms that are often colourful and fragrant, commonly known as the orchid family. Along with the Asteraceae, they are one of the two largest families of flowering plants. The Orchidaceae have about 28,000 currently accepted species, distributed in about 763 genera. The determination of which family is larger is still under debate, because verified data on the members of such enormous families are continually in flux. Regardless, the number of orchid species nearly equals the number of bony fishes and is more than twice the number of bird species, and about four times the number of mammal species. The family encompasses about 6–11% of all seed plants. The largest genera are Bulbophyllum (2,000 species), Epidendrum (1,500 species), Dendrobium (1,400 species) and Pleurothallis (1,000 species). It also includes Vanilla–the genus of the vanilla plant, the type genus Orchis, and many commonly cultivated plants such as Phalaenopsis and Cattleya. Moreover, since the introduction of tropical species into cultivation in the 19th century, horticulturists have produced more than 100,000 hybrids and cultivars. Orchids are easily distinguished from other plants, as they share some very evident, shared derived characteristics, or synapomorphies. Among these are: bilateral symmetry of the flower (zygomorphism), many resupinate flowers, a nearly always highly modified petal (labellum), fused stamens and carpels, and extremely small seeds. Germinating seeds of the temperate orchid Anacamptis coriophora. The protocorm is the first organ that will develop into true roots and leaves. Monopodial: The stem grows from a single bud, leaves are added from the apex each year and the stem grows longer accordingly. The stem of orchids with a monopodial growth can reach several metres in length, as in Vanda and Vanilla. Sympodial: Sympodial orchids have a front (the newest growth) and a back (the oldest growth). The plant produces a series of adjacent shoots, which grow to a certain size, bloom and then stop growing and are replaced. Sympodial orchids grow laterally rather than vertically, following the surface of their support. The growth continues by development of new leads, with their own leaves and roots, sprouting from or next to those of the previous year, as in Cattleya. While a new lead is developing, the rhizome may start its growth again from a so-called 'eye', an undeveloped bud, thereby branching. Sympodial orchids may have visible pseudobulbs joined by a rhizome, which creeps along the top or just beneath the soil. Terrestrial orchids may be rhizomatous or form corms or tubers. The root caps of terrestrial orchids are smooth and white. Some sympodial terrestrial orchids, such as Orchis and Ophrys, have two subterranean tuberous roots. One is used as a food reserve for wintry periods, and provides for the development of the other one, from which visible growth develops. In warm and constantly humid climates, many terrestrial orchids do not need pseudobulbs. Epiphytic orchids, those that grow upon a support, have modified aerial roots that can sometimes be a few meters long. In the older parts of the roots, a modified spongy epidermis, called velamen, has the function of absorbing humidity. It is made of dead cells and can have a silvery-grey, white or brown appearance. In some orchids, the velamen includes spongy and fibrous bodies near the passage cells, called tilosomes. The cells of the root epidermis grow at a right angle to the axis of the root to allow them to get a firm grasp on their support. Nutrients for epiphytic orchids mainly come from mineral dust, organic detritus, animal droppings and other substances collecting among on their supporting surfaces. The base of the stem of sympodial epiphytes, or in some species essentially the entire stem, may be thickened to form a pseudobulb that contains nutrients and water for drier periods. The pseudobulb has a smooth surface with lengthwise grooves, and can have different shapes, often conical or oblong. Its size is very variable; in some small species of Bulbophyllum, it is no longer than two millimeters, while in the largest orchid in the world, Grammatophyllum speciosum (giant orchid), it can reach three meters. Some Dendrobium species have long, canelike pseudobulbs with short, rounded leaves over the whole length; some other orchids have hidden or extremely small pseudobulbs, completely included inside the leaves. With ageing, the pseudobulb sheds its leaves and becomes dormant. At this stage, it is often called a backbulb. Backbulbs still hold nutrition for the plant, but then a pseudobulb usually takes over, exploiting the last reserves accumulated in the backbulb, which eventually dies off, too. A pseudobulb typically lives for about five years. Orchids without noticeable pseudobulbs are also said to have growths, an individual component of a sympodial plant. Like most monocots, orchids generally have simple leaves with parallel veins, although some Vanilloideae have reticulate venation. Leaves may be ovate, lanceolate, or orbiculate, and very variable in size on the individual plant. Their characteristics are often diagnostic. They are normally alternate on the stem, often folded lengthwise along the centre ("plicate"), and have no stipules. Orchid leaves often have siliceous bodies called stegmata in the vascular bundle sheaths (not present in the Orchidoideae) and are fibrous. The structure of the leaves corresponds to the specific habitat of the plant. Species that typically bask in sunlight, or grow on sites which can be occasionally very dry, have thick, leathery leaves and the laminae are covered by a waxy cuticle to retain their necessary water supply. Shade-loving species, on the other hand, have long, thin leaves. The leaves of most orchids are perennial, that is, they live for several years, while others, especially those with plicate leaves as in Catasetum, shed them annually and develop new leaves together with new pseudobulbs. The leaves of some orchids are considered ornamental. The leaves of the Macodes sanderiana, a semiterrestrial or rock-hugging ("lithophyte") orchid, show a sparkling silver and gold veining on a light green background. The cordate leaves of Psychopsis limminghei are light brownish-green with maroon-puce markings, created by flower pigments. The attractive mottle of the leaves of lady's slippers from tropical and subtropical Asia (Paphiopedilum), is caused by uneven distribution of chlorophyll. Also, Phalaenopsis schilleriana is a pastel pink orchid with leaves spotted dark green and light green. The jewel orchid (Ludisia discolor) is grown more for its colorful leaves than its white flowers. Some orchids, such as Dendrophylax lindenii (ghost orchid), Aphyllorchis and Taeniophyllum depend on their green roots for photosynthesis and lack normally developed leaves, as do all of the heterotrophic species. Orchids of the genus Corallorhiza (coralroot orchids) lack leaves altogether and instead wrap their roots around the roots of mature trees and use specialized fungi to harvest sugars. The Orchidaceae are well known for the many structural variations in their flowers. Some orchids have single flowers, but most have a racemose inflorescence, sometimes with a large number of flowers. The flowering stem can be basal, that is, produced from the base of the tuber, like in Cymbidium, apical, meaning it grows from the apex of the main stem, like in Cattleya, or axillary, from the leaf axil, as in Vanda. As an apomorphy of the clade, orchid flowers are primitively zygomorphic (bilaterally symmetrical), although in some genera, such as Mormodes, Ludisia, and Macodes, this kind of symmetry may be difficult to notice. The orchid flower, like most flowers of monocots, has two whorls of sterile elements. The outer whorl has three sepals and the inner whorl has three petals. The sepals are usually very similar to the petals (thus called tepals, 1), but may be completely distinct. The medial petal, called the labellum or lip (6), which is always modified and enlarged, is actually the upper medial petal; however, as the flower develops, the inferior ovary (7) or the pedicel usually rotates 180°, so that the labellum arrives at the lower part of the flower, thus becoming suitable to form a platform for pollinators. This characteristic, called resupination, occurs primitively in the family and is considered apomorphic, a derived characteristic all Orchidaceae share. The torsion of the ovary is very evident from the longitudinal section shown (below right). Some orchids have secondarily lost this resupination, e.g. Epidendrum secundum. The normal form of the sepals can be found in Cattleya, where they form a triangle. In Paphiopedilum (Venus slippers), the lower two sepals are fused into a synsepal, while the lip has taken the form of a slipper. In Masdevallia, all the sepals are fused. Orchid flowers with abnormal numbers of petals or lips are called peloric. Peloria is a genetic trait, but its expression is environmentally influenced and may appear random. Laeliocattleya cultivar shows the normal form of petals. Orchid flowers primitively had three stamens, but this situation is now limited to the genus Neuwiedia. Apostasia and the Cypripedioideae have two stamens, the central one being sterile and reduced to a staminode. All of the other orchids, the clade called Monandria, retain only the central stamen, the others being reduced to staminodes (4). The filaments of the stamens are always adnate (fused) to the style to form cylindrical structure called the gynostemium or column (2). In the primitive Apostasioideae, this fusion is only partial; in the Vanilloideae, it is more deep; in Orchidoideae and Epidendroideae, it is total. The stigma (9) is very asymmetrical, as all of its lobes are bent towards the centre of the flower and lie on the bottom of the column. Pollen is released as single grains, like in most other plants, in the Apostasioideae, Cypripedioideae, and Vanilloideae. In the other subfamilies, which comprise the great majority of orchids, the anther (3) carries two pollinia. A pollinium is a waxy mass of pollen grains held together by the glue-like alkaloid viscin, containing both cellulosic strands and mucopolysaccharides. Each pollinium is connected to a filament which can take the form of a caudicle, as in Dactylorhiza or Habenaria, or a stipe, as in Vanda. Caudicles or stipes hold the pollinia to the viscidium, a sticky pad which sticks the pollinia to the body of pollinators. At the upper edge of the stigma of single-anthered orchids, in front of the anther cap, is the rostellum (5), a slender extension involved in the complex pollination mechanism. As mentioned, the ovary is always inferior (located behind the flower). It is three-carpelate and one or, more rarely, three-partitioned, with parietal placentation (axile in the Apostasioideae). In 2011, Bulbophyllum nocturnum was discovered to flower nocturnally. The complex mechanisms that orchids have evolved to achieve cross-pollination were investigated by Charles Darwin and described in Fertilisation of Orchids (1862). Orchids have developed highly specialized pollination systems, thus the chances of being pollinated are often scarce, so orchid flowers usually remain receptive for very long periods, rendering unpollinated flowers long-lasting in cultivation. Most orchids deliver pollen in a single mass. Each time pollination succeeds, thousands of ovules can be fertilized. Pollinators are often visually attracted by the shape and colours of the labellum. However, some Bulbophyllum species attract male fruit flies (Bactrocera spp.) solely via a floral chemical which simultaneously acts as a floral reward (e.g. methyl eugenol, raspberry ketone, or zingerone) to perform pollination. The flowers may produce attractive odours. Although absent in most species, nectar may be produced in a spur of the labellum (8 in the illustration above), or on the point of the sepals, or in the septa of the ovary, the most typical position amongst the Asparagales. In orchids that produce pollinia, pollination happens as some variant of the following sequence: when the pollinator enters into the flower, it touches a viscidium, which promptly sticks to its body, generally on the head or abdomen. While leaving the flower, it pulls the pollinium out of the anther, as it is connected to the viscidium by the caudicle or stipe. The caudicle then bends and the pollinium is moved forwards and downwards. When the pollinator enters another flower of the same species, the pollinium has taken such position that it will stick to the stigma of the second flower, just below the rostellum, pollinating it. 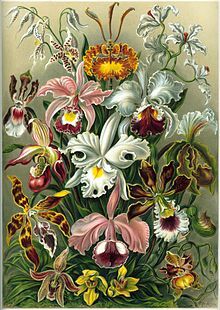 The possessors of orchids may be able to reproduce the process with a pencil, small paintbrush, or other similar device. Some orchids mainly or totally rely on self-pollination, especially in colder regions where pollinators are particularly rare. The caudicles may dry up if the flower has not been visited by any pollinator, and the pollinia then fall directly on the stigma. Otherwise, the anther may rotate and then enter the stigma cavity of the flower (as in Holcoglossum amesianum). The slipper orchid Paphiopedilum parishii reproduces by self-fertilization. This occurs when the anther changes from a solid to a liquid state and directly contacts the stigma surface without the aid of any pollinating agent or floral assembly. The labellum of the Cypripedioideae is poke bonnet-shaped, and has the function of trapping visiting insects. The only exit leads to the anthers that deposit pollen on the visitor. In some extremely specialized orchids, such as the Eurasian genus Ophrys, the labellum is adapted to have a colour, shape, and odour which attracts male insects via mimicry of a receptive female. Pollination happens as the insect attempts to mate with flowers. Many neotropical orchids are pollinated by male orchid bees, which visit the flowers to gather volatile chemicals they require to synthesize pheromonal attractants. Males of such species as Euglossa imperialis or Eulaema meriana have been observed to leave their territories periodically to forage for aromatic compounds, such as cineole, to synthesize pheromone for attracting and mating with females. Each type of orchid places the pollinia on a different body part of a different species of bee, so as to enforce proper cross-pollination. A rare achlorophyllous saprophytic orchid growing entirely underground in Australia, Rhizanthella slateri, is never exposed to light, and depends on ants and other terrestrial insects to pollinate it. Catasetum, a genus discussed briefly by Darwin, actually launches its viscid pollinia with explosive force when an insect touches a seta, knocking the pollinator off the flower. After pollination, the sepals and petals fade and wilt, but they usually remain attached to the ovary. Some species, such as Phalaenopsis, Dendrobium, and Vanda, produce offshoots or plantlets formed from one of the nodes along the stem, through the accumulation of growth hormones at that point. These shoots are known as keiki. The ovary typically develops into a capsule that is dehiscent by three or six longitudinal slits, while remaining closed at both ends. The seeds are generally almost microscopic and very numerous, in some species over a million per capsule. After ripening, they blow off like dust particles or spores. They lack endosperm and must enter symbiotic relationships with various mycorrhizal basidiomyceteous fungi that provide them the necessary nutrients to germinate, so all orchid species are mycoheterotrophic during germination and reliant upon fungi to complete their lifecycles. As the chance for a seed to meet a suitable fungus is very small, only a minute fraction of all the seeds released grow into adult plants. In cultivation, germination typically takes weeks. Horticultural techniques have been devised for germinating orchid seeds on an artificial nutrient medium, eliminating the requirement of the fungus for germination and greatly aiding the propagation of ornamental orchids. The usual medium for the sowing of orchids in artificial conditions is agar agar gel combined with a carbohydrate energy source. The carbohydrate source can be combinations of discrete sugars or can be derived from other sources such as banana, pineapple, peach, or even tomato puree or coconut water. After the preparation of the agar agar medium, it is poured into test tubes or jars which are then autoclaved (or cooked in a pressure cooker) to sterilize the medium. After cooking, the medium begins to gel as it cools. The taxonomy of this family is in constant flux, as new studies continue to clarify the relationships between species and groups of species, allowing more taxa at several ranks to be recognized. The Orchidaceae is currently placed in the order Asparagales by the APG III system of 2009. Five subfamilies are recognised. The cladogram below was made according to the APG system of 1998. It represents the view that most botanists had held up to that time. It was supported by morphological studies, but never received strong support in molecular phylogenetic studies. In 2015, a phylogenetic study showed strong statistical support for the following topology of the orchid tree, using 9 kb of plastid and nuclear DNA from 7 genes, a topology that was confirmed by a phylogenomic study in the same year. A study in the scientific journal Nature has hypothesised that the origin of orchids goes back much longer than originally expected. An extinct species of stingless bee, Proplebeia dominicana, was found trapped in Miocene amber from about 15-20 million years ago. The bee was carrying pollen of a previously unknown orchid taxon, Meliorchis caribea, on its wings. This find is the first evidence of fossilised orchids to date and shows insects were active pollinators of orchids then. This extinct orchid, M. caribea, has been placed within the extant tribe Cranichideae, subtribe Goodyerinae (subfamily Orchidoideae). An even older orchid species, Succinanthera baltica, was described from the Eocene Baltic amber by Poinar & Rasmussen (2017). Genetic sequencing indicates orchids may have arisen earlier, 76 to 84 million years ago during the Late Cretaceous. According to Mark W. Chase et al. (2001), the overall biogeography and phylogenetic patterns of Orchidaceae show they are even older and may go back roughly 100 million years. Using the molecular clock method, it was possible to determine the age of the major branches of the orchid family. This also confirmed that the subfamily Vanilloideae is a branch at the basal dichotomy of the monandrous orchids, and must have evolved very early in the evolution of the family. Since this subfamily occurs worldwide in tropical and subtropical regions, from tropical America to tropical Asia, New Guinea and West Africa, and the continents began to split about 100 million years ago, significant biotic exchange must have occurred after this split (since the age of Vanilla is estimated at 60 to 70 million years). Genome duplication occurred prior to the divergence of this taxon. The type genus (i.e. the genus after which the family is named) is Orchis. The genus name comes from the Ancient Greek ὄρχις (órkhis), literally meaning "testicle", because of the shape of the twin tubers in some species of Orchis. The term "orchid" was introduced in 1845 by John Lindley in School Botany, as a shortened form of Orchidaceae. In Middle English, the name bollockwort was used for some orchids, based on "bollock" meaning testicle and "wort" meaning plant. Orchidaceae are cosmopolitan, occurring in almost every habitat apart from glaciers. The world's richest diversity of orchid genera and species is found in the tropics, but they are also found above the Arctic Circle, in southern Patagonia, and two species of Nematoceras on Macquarie Island at 54° south. A majority of orchids are perennial epiphytes, which grow anchored to trees or shrubs in the tropics and subtropics. Species such as Angraecum sororium are lithophytes, growing on rocks or very rocky soil. Other orchids (including the majority of temperate Orchidaceae) are terrestrial and can be found in habitat areas such as grasslands or forest. Some orchids, such as Neottia and Corallorhiza, lack chlorophyll, so are unable to photosynthesise. Instead, these species obtain energy and nutrients by parasitising soil fungi through the formation of orchid mycorrhizas. The fungi involved include those that form ectomycorrhizas with trees and other woody plants, parasites such as Armillaria, and saprotrophs. These orchids are known as myco-heterotrophs, but were formerly (incorrectly) described as saprophytes as it was believed they gained their nutrition by breaking down organic matter. While only a few species are achlorophyllous holoparasites, all orchids are myco-heterotrophic during germination and seedling growth, and even photosynthetic adult plants may continue to obtain carbon from their mycorrhizal fungi. A Brassolaeliocattleya ("BLC") Paradise Jewel 'Flame' hybrid orchid. Blooms of the Cattleya alliance are often used in ladies' corsages. The scent of orchids is frequently analysed by perfumers (using headspace technology and gas-liquid chromatography/mass spectrometry) to identify potential fragrance chemicals. The other important use of orchids is their cultivation for the enjoyment of the flowers. Most cultivated orchids are tropical or subtropical, but quite a few that grow in colder climates can be found on the market. Temperate species available at nurseries include Ophrys apifera (bee orchid), Gymnadenia conopsea (fragrant orchid), Anacamptis pyramidalis (pyramidal orchid) and Dactylorhiza fuchsii (common spotted orchid). Orchids of all types have also often been sought by collectors of both species and hybrids. Many hundreds of societies and clubs worldwide have been established. These can be small, local clubs, or larger, national organisations such as the American Orchid Society. Both serve to encourage cultivation and collection of orchids, but some go further by concentrating on conservation or research. The term "botanical orchid" loosely denotes those small-flowered, tropical orchids belonging to several genera that do not fit into the "florist" orchid category. A few of these genera contain enormous numbers of species. Some, such as Pleurothallis and Bulbophyllum, contain approximately 1700 and 2000 species, respectively, and are often extremely vegetatively diverse. The primary use of the term is among orchid hobbyists wishing to describe unusual species they grow, though it is also used to distinguish naturally occurring orchid species from horticulturally created hybrids. New orchids are registered with the International Orchid Register, maintained by the Royal Horticultural Society. The dried seed pods of one orchid genus, Vanilla (especially Vanilla planifolia), are commercially important as a flavouring in baking, for perfume manufacture and aromatherapy. The underground tubers of terrestrial orchids [mainly Orchis mascula (early purple orchid)] are ground to a powder and used for cooking, such as in the hot beverage salep or in the Turkish frozen treat dondurma. The name salep has been claimed to come from the Arabic expression ḥasyu al-tha‘lab, "fox testicles", but it appears more likely the name comes directly from the Arabic name saḥlab. The similarity in appearance to testes naturally accounts for salep being considered an aphrodisiac. The dried leaves of Jumellea fragrans are used to flavour rum on Reunion Island. Orchids have been used in traditional medicine in an effort to treat many diseases and ailments. They have been used as a source of herbal remedies in China since 2800 BC. Gastrodia elata is one of the three orchids listed in the earliest known Chinese Materia Medica (Shennon bencaojing) (c. 100 AD). Theophrastus mentions orchids in his Enquiry into Plants (372–286 BC). Orchids have many associations with symbolic values. For example, the orchid is the City Flower of Shaoxing, China. Cattleya mossiae is the national Venezuelan flower, while Cattleya trianae is the national flower of Colombia. Vanda 'Miss Joaquim' is the national flower of Singapore, Guarianthe skinneri is the national flower of Costa Rica and Rhyncholaelia digbyana is the national flower of Honduras. Prosthechea cochleata is the national flower of Belize, where it is known as the black orchid. Lycaste skinneri has a white variety (alba) that is the national flower of Guatemala, commonly known as Monja Blanca (White Nun). Panama's national flower is the Holy Ghost orchid (Peristeria elata), or 'the flor del Espiritu Santo'. ^ Early western district (Vic.) settler gives account of local Aboriginal people gathering potato orchid tubers, digging where bandicoots had scratched. ^ The symbolic (or even religious) meaning of the Ara Pacis orchids is not yet known. ^ a b Angiosperm Phylogeny Group (2009). "An update of the Angiosperm Phylogeny Group classification for the orders and families of flowering plants: APG III". Botanical Journal of the Linnean Society. 161 (2): 105–121. doi:10.1111/j.1095-8339.2009.00996.x. Archived from the original (PDF) on 25 May 2017. Retrieved 26 June 2013. ^ "WCSP". World Checklist of Selected Plant Families. Retrieved 2 April 2010. (See External links below). ^ Yohan Pillon & Mark W. Chase (2007). "Taxonomic exaggeration and its effects on orchid conservation". Conservation Biology. 21 (1): 263–265. doi:10.1111/j.1523-1739.2006.00573.x. PMID 17298532. ^ Nash, N., and Frownie, S. (2008). Complete guide to orchids. (Meredith Publishing Group) p. 12. ^ Jenny King (10 June 2011). "The coralroot orchid". Orchids in Northern Washington State. Silvercrown Mountain Outdoor School. Retrieved 10 June 2011. ^ Tom Lawrie (23 November 2010). "World's first night-flowering orchid discovered". Australian Geographic. Archived from the original on 30 November 2011. Retrieved 26 May 2013. ^ Tan K.H. ; Nishida R. (2000). "Mutual reproductive benefits between a wild orchid, Bulbophyllum patens, and Bactrocera fruit flies via a floral synomone". Journal of Chemical Ecology. 26 (2): 533–546. doi:10.1023/A:1005477926244. , 28:1161-1172 and 31(3): 509-519. ^ Chen LJ, Liu KW, Xiao XJ, Tsai WC, Hsiao YY, Huang J, Liu ZJ (2012). "The anther steps onto the stigma for self-fertilization in a slipper orchid". PLoS ONE. 7 (5): e37478. doi:10.1371/journal.pone.0037478. PMC 3359306. PMID 22649529. ^ Kimsey Lynn Siri (1980). "The behaviour of male orchid bees (Apidae, Hymenoptera, Insecta) and the question of leks". Animal Behaviour. 28 (4): 996–1004. doi:10.1016/s0003-3472(80)80088-1. ^ Zimmermann, Yvonne; Roubik, David W.; Eltz, Thomas (19 July 2006). "Species-specific attraction to pheromonal analogues in orchid bees". Behavioral Ecology and Sociobiology. 60 (6): 833–843. doi:10.1007/s00265-006-0227-8. ISSN 0340-5443. ^ Guillaume Chomicki; Luc P.R. Bidel; Feng Ming; Mario Coiro; Xuan Zhang; Yaofeng Wang; Yves Baissac; Christian Jay-Allemand & Susanne S. Renner (2015). "The velamen protects photosynthetic orchid roots against UV‐B damage, and a large dated phylogeny implies multiple gains and losses of this function during the Cenozoic". New Phytologist. 205 (3): 1330–1341. doi:10.1111/nph.13106. ^ a b Santiago R. Ramírez; Barbara Gravendeel; Rodrigo B. Singer; Charles R. Marshall; Naomi E. Pierce (30 August 2007). "Dating the origin of the Orchidaceae from a fossil orchid with its pollinator". Nature. 448 (7157): 1042–5. doi:10.1038/nature06039. PMID 17728756. ^ George Poinar, Jr.; Finn N. Rasmussen (2017). "Orchids from the past, with a new species in Baltic amber". Botanical Journal of the Linnean Society. 183 (3): 327–333. doi:10.1093/botlinnean/bow018. ^ "An overview of the Phalaenopsis orchid genome by BAC sequence analysis" (pdf format). ^ Mark W. Chase (2001). "The origin and biogeography of Orchidaceae". In A. M. Pridgeon; P. J. Cribb; M. W. Chase; F. Rasmussen (eds.). Orchidoideae (Part 1). Genera Orchidacearum. 2. Oxford University Press. pp. 1–5. ISBN 978-0-19-850710-9. ^ Zhang, Guo-Qiang; Liu, Ke-Wei; Li, Zhen; Lohaus, Rolf; Hsiao, Yu-Yun; Niu, Shan-Ce; Wang, Jie-Yu; Lin, Yao-Cheng; Xu, Qing; Chen, Li-Jun; Yoshida, Kouki; Fujiwara, Sumire; Wang, Zhi-Wen; Zhang, Yong-Qiang; Mitsuda, Nobutaka; Wang, Meina; Liu, Guo-Hui; Pecoraro, Lorenzo; Huang, Hui-Xia; Xiao, Xin-Ju; Lin, Min; Wu, Xin-Yi; Wu, Wan-Lin; Chen, You-Yi; Chang, Song-Bin; Sakamoto, Shingo; Ohme-Takagi, Masaru; Yagi, Masafumi; Zeng, Si-Jin; et al. (2017). "The Apostasia genome and the evolution of orchids" (PDF). Nature. 549 (7672): 379–383. doi:10.1038/nature23897. PMID 28902843. ^ Joan Corominas (1980). Breve Diccionario Etimológico de la Lengua Castellana. Ed. Gredos. p. 328. ISBN 978-84-249-1332-8. ^ Hyam, R. & Pankhurst, R.J. (1995). Plants and their names : a concise dictionary. Oxford: Oxford University Press. ISBN 978-0-19-866189-4. ^ Online Etymology Dictionary, "orchid". ^ Grigson, G. (1973). A Dictionary of English Plant Names. London: Allen Lane. ISBN 978-0-7139-0442-0. ^ Melissa Whitman; Michael Medler; Jean Jacques Randriamanindry; Elisabeth Rabakonandrianina (2011). "Conservation of Madagascar's granite outcrop orchids: influence of fire and moisture" (PDF). Lankesteriana. 11 (1): 55–67. doi:10.15517/lank.v11i1.18315. ^ Jonathan R. Leake (2005). "Plants parasitic on fungi: unearthing the fungi in myco-heterotrophs and debunking the 'saprophytic' plant myth". Mycologist. 19 (3): 113–122. doi:10.1017/S0269915X05003046. ^ Gross, K.; Sun, M; Schiestl, F. P. (2016). "Why Do Floral Perfumes Become Different? Region-Specific Selection on Floral Scent in a Terrestrial Orchid". PLoS ONE. 11 (2): e0147975. doi:10.1371/journal.pone.0147975. PMC 4757410. PMID 26886766. ^ Zola, Nellie; Gott, Beth (1992). Koorie Plants, Koorie People: Traditional Aboriginal Food, Fibre and Healing Plants of Victoria. Koorie Heritage Trust Incorporated. p. 38. ISBN 978-1-875606-10-8. ^ "Simbolos Patrios" (in Spanish). Retrieved 22 June 2008. ^ "National Symbols". Government of Belize. Archived from the original on 12 October 2007. Retrieved 6 April 2008. ^ Jarrett A. Lobelli (2012). "The Emperor's orchids". Archaeology. 66 (1): 16. Archived from the original on 13 December 2012. RHS (2016). "Search The International Orchid Register". Royal Horticultural Society. Retrieved 28 November 2017. Wikimedia Commons has media related to Orchidaceae.